We weren’t sure if we were biting off more than we could chew when we decided to attempt these two bad boys in one day, but quite frankly we were running out of time. We did our research and decided it should be achievable for what we wanted to do… fingers crossed! From Osaka, it is possible to catch the local line, a rapid service or the shinkansen to Himeji. We opted for the second, but in hindsight we wish we had just gone for the shinkansen (the reason we didn’t was because the rapid service left immediately, but we had to wait a bit longer for the shinkansen). We ended up experiencing quite significant delays, meaning the shinkansen would have been the better option. It took us about 80 minutes to get to Himeji. 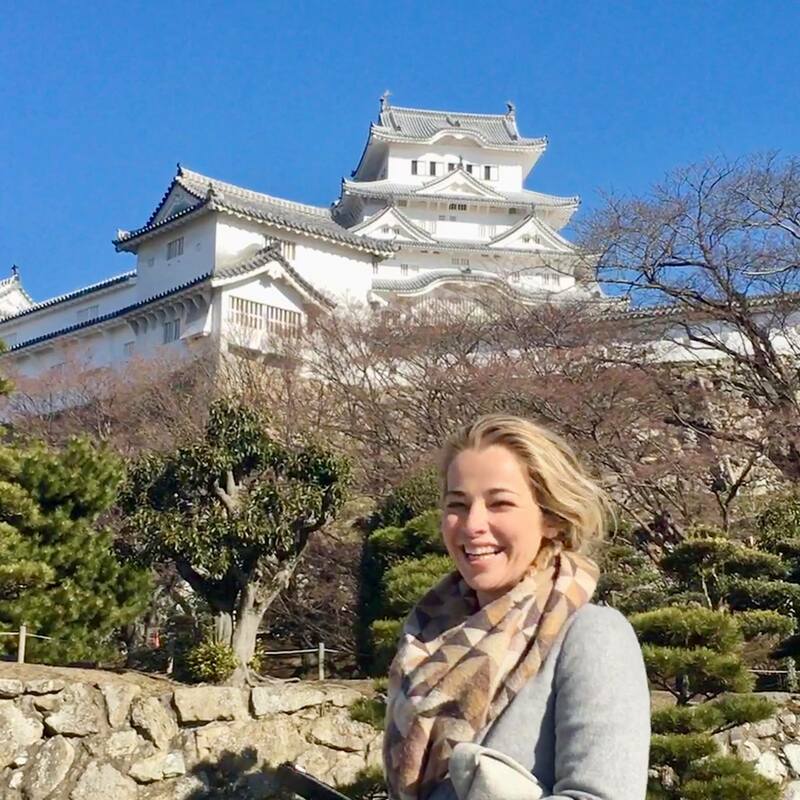 There are two main sights: the most iconic is the Himeji Castle: a majestic white castle perched on the hill, with its six pagodas visible basically from the entire city. The other is visiting Mt Shosu, of which there is a ropeway you can catch followed up by a hike, but we chose to omit this because (a) it was too cold; and (b) we thought it would take too long. 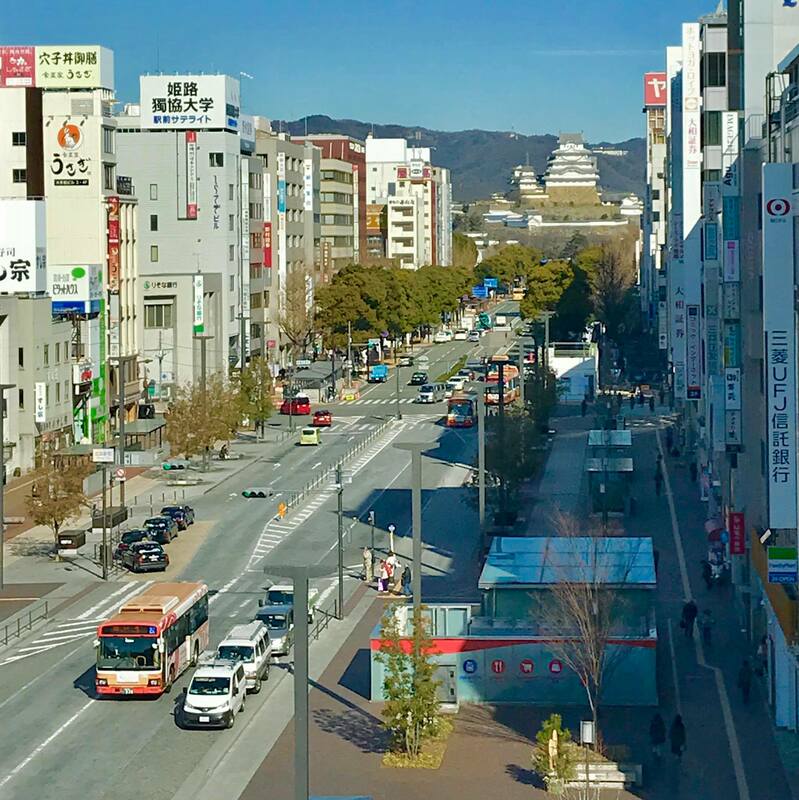 As soon as we left the station we could see the Himeji Castle towering over the wide open street ahead of us. It was a beautiful clear day and a pleasant, crisp walk. We walked around the grounds and touched on the gardens, but decided that in the interests of time, money and warmth, we would keep the ¥1000 entry fee in our pockets and keep moving on. 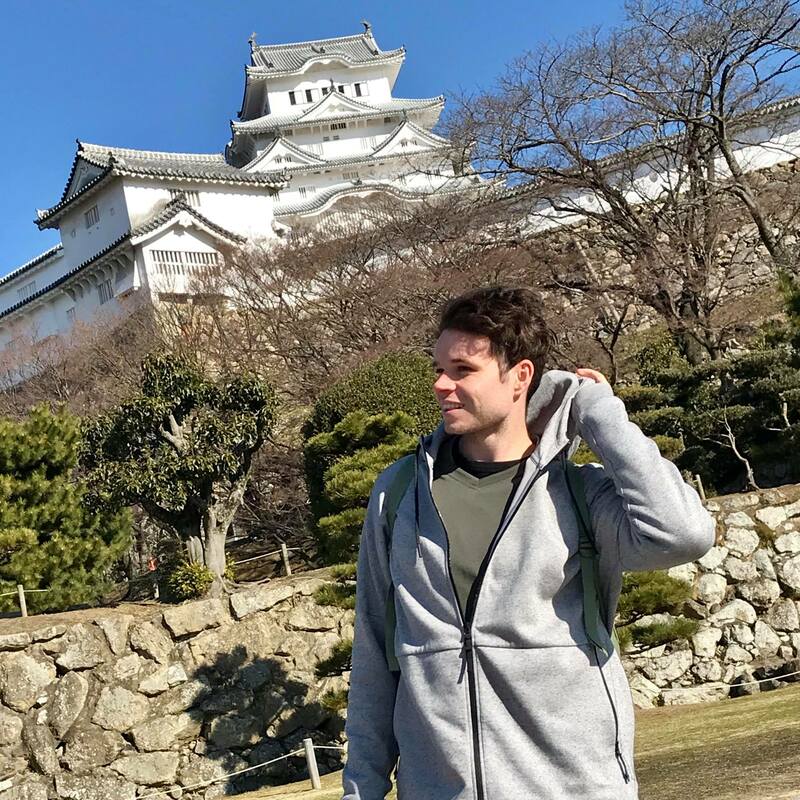 I think had we not already been to Matsumoto Castle, and if we weren’t trying to visit Hiroshima in the same day, we almost certainly would have gone in. Back at the station we learnt that the next available shinkansen was not for another 50 minutes. Note, JR pass holders are not entitled to ride on the Nazomi shinkansen. To kill time, we went and had coffee at the fourth floor Starbucks in the adjacent shopping mall. The view from our window seat looked directly down that same main street and gave us perfect alignment with the castle. We arrived at Hiroshima a little before 2pm. From the station we headed outside to the sightseeing bus stop (by the shinkansen entrance). With our JR passes we got to ride the city’s hop-on hop-off service for free, which made getting around not only very easy, but also pretty fun. We got off at the Hiroshima Peace Memorial Museum. For ¥200, it would have to be one of the most touching museums I have ever visited. The main building was closed for renovation (it is supposed to re-open late 2018), and so everything had been shifted to the east building. The first part was a timeline detailing the history, facts and context surrounding the bombing. There were survivor testimonies on video and downstairs there was a room with artefacts and accompanying stories. 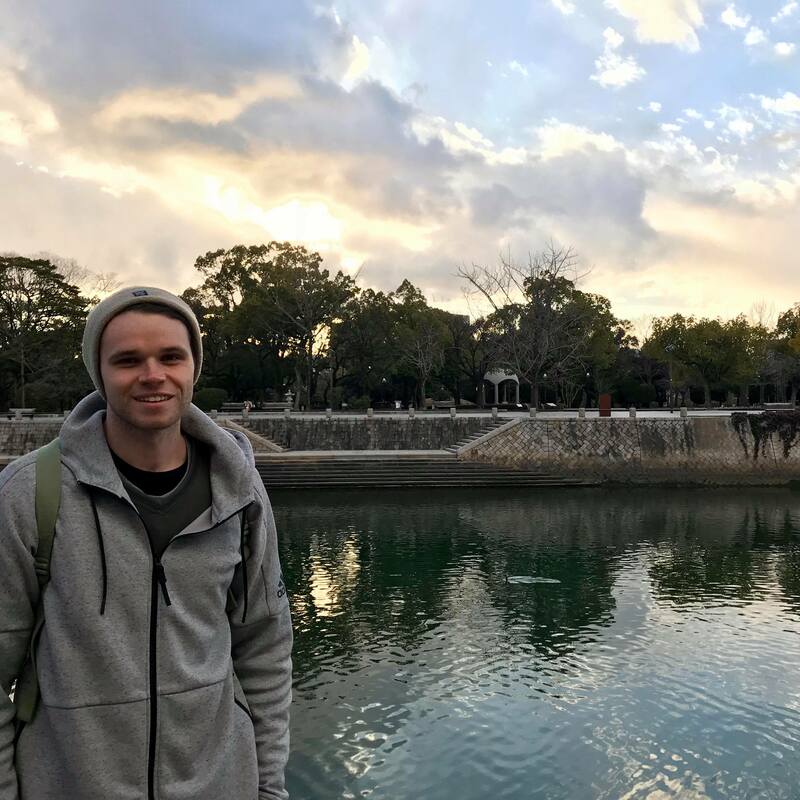 I don’t think you could visit Hiroshima and not see the museum – it truly was a heartfelt experience. We got an audio guide for an additional ¥200, but a large proportion of the content was just reading aloud what had been written on the walls, so definitely not a must do. From the museum we walked through the Peace Memorial Park to the Atomic Bomb Dome. The park is super scenic – there are rivers on both sides and more than a few memorials scattered through the park. In the middle is the cenotaph, through which lies the Flame of Peace – a flame that will continue to burn until all the world’s nuclear weapons are destroyed. Both of these align exactly with the Atomic Bomb Dome, making for a very cool sight. The Atomic Bomb Dome lies at the far end of the park and is probably the most confronting reminder of the devastation caused back in 1945. It used to be a hall and when the bomb exploded (basically 600m directly above it) everyone inside the building died but most of the building managed to survive the impact (almost no other buildings survived) and remains today as a memorial. It is blocked off to the public, but I don’t know that I would have wanted to go inside anyway; it was pretty haunting. 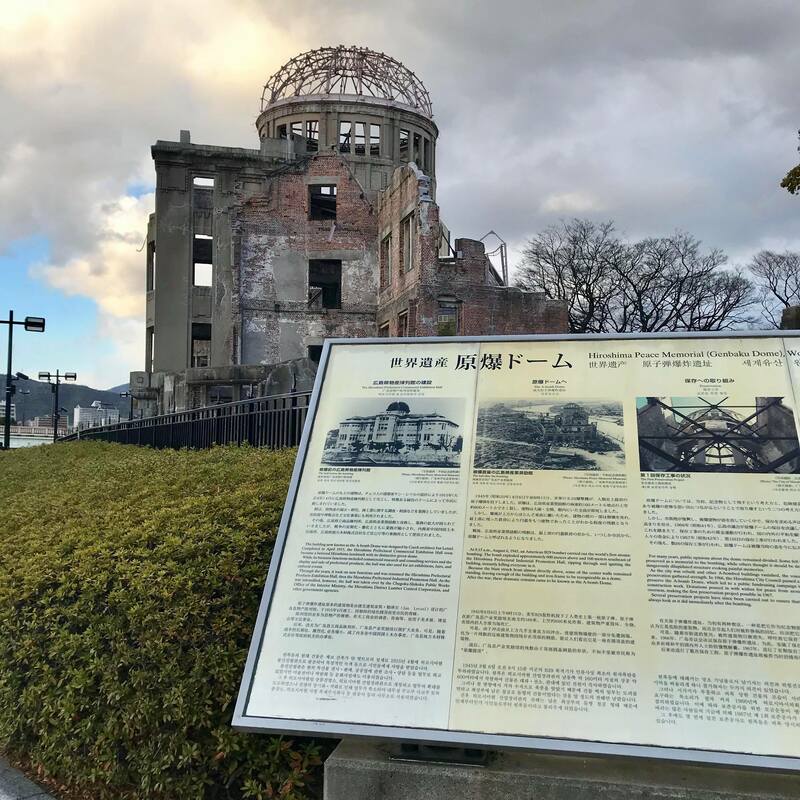 Once we had finished viewing the Dome we hopped back onto the bus and sat back for the remainder of its loop, enjoying the sights of Hiroshima city before being dropped back at the station. Our shinkansen back was direct, so we ended up making it home in time for dinner. A day well done, in our opinion.